Knife Cold Steel Frenzy I(62P1A) High quality Cold Steel knives, throwing knives, tactical knives. Designed by award-winning custom knife-maker Andrew Demko, the Cold Steel Frenzy takes its inspiration from ancient Japanese Kabutowari – with a thick spine, slender blade, needle-sharp piercing point and a long flat cutting edge. Made from premium American S35VN(62P1A) or CTS XHP(62PV1) steel for superior edge retention, and line-grain satin polished with a deep fuller, the Frenzy’s 5.5” blade is as visually appealing as it is effective, and as it catches the light it’s truly a wonder to behold! 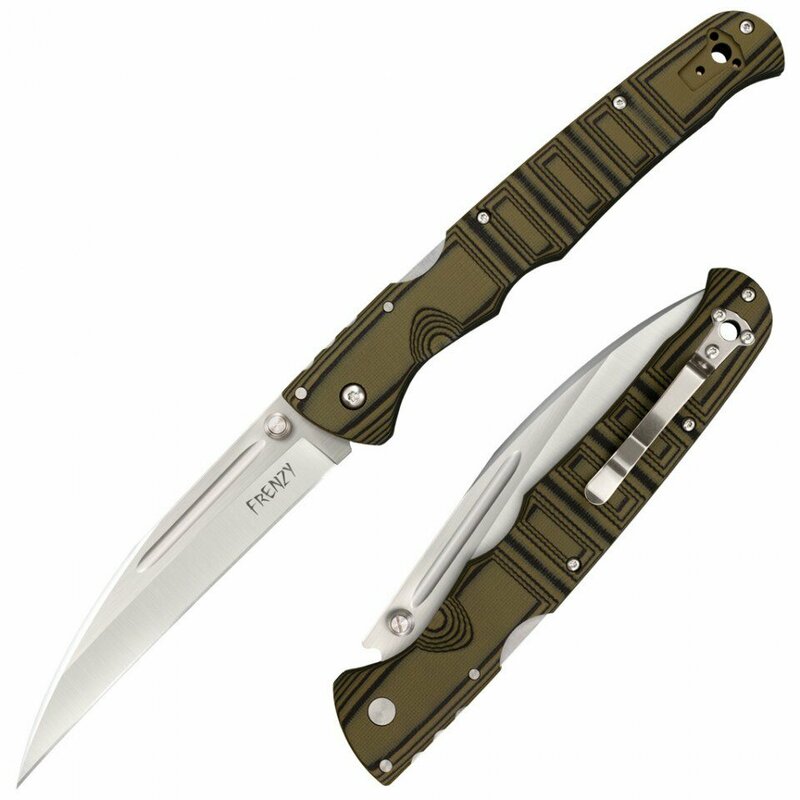 The Frenzy’s handle is made from multiple layered and 3D CNC Machined dual-tone G-10. It’s thin and flat enough to comfortably carry without “printing” while it’s expertly designed and ergonomically contoured shape provides both comfort and retention in any grip. Equipped with the ground-breaking Tri-Ad® locking mechanism for supreme endurance, reliability and safety, the Frenzy is a sleek and stylish mega-folder that takes up very little space in your pocket but snaps open to become a true force to be reckoned with!